I have just spent two nights in New York – without leaving the English Channel. 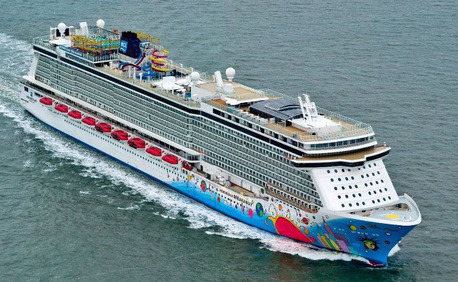 From bow to stern, brand-new cruise ship Norwegian Breakaway is dedicated to the Big Apple – although it would be fairer to say the inspiration comes direct from native New Yorker Kevin Sheehan who just happens to be boss of the company. The ship’s 1,062ft-long hull is decorated with pop-art representations of some of the city’s landmarks; the popular Ice Bar, kept at a constant 17 degrees, is filled with ice sculptures of the Chrysler Building and the Brooklyn Bridge. Videos of the Radio City Music Hall Rockettes – leggy dancers who will be the ship’s godmothers at a lavish naming ceremony in Manhattan next week – were playing constantly on the giant two-deck-high LED screen in the Central Atrium (below). Cookies and cakes in the Atrium Café come straight from the onboard Carlo’s Bakehouse – based on the original in New Jersey operated by Buddy Valastro. But what is the ship really like to travel on? Anyone who has travelled on big sister Norwegian Epic will find a lot that is familiar. With features such as single studio cabins, controversial bathrooms and sensational entertainment, Epic was ground-breaking in many ways but not without its faults. Breakaway has taken the best aspects of Epic and refined them, while leaving behind most of the let-downs. O’Sheehan’s Pub (wonder where that name came from?) 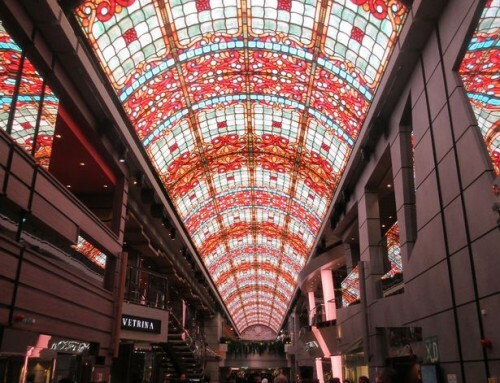 at the centre of the ship is open 24 hours a day serving food and drink, and overlooking the entertainment in the atrium and on that big screen. Popular extra-charge restaurants such as the upscale Bistro, the theatrical Teppanyaki and the red-blooded Moderna churrascaria are all here. What’s different is that some of them, plus Cagney’s steakhouse, Geoffrey Zakarian’s Ocean Blue, and the Italian La Cucina also have outdoor seating on the extensive Deck 8 Waterfront. The open-air bars and restaurants were not in use for the chilly crossing from Rotterdam, but they were packed with carousing travel agents in Southampton yesterday and they’ll be even more popular when the ship reaches warmer waters around Bermuda and in the Bahamas. Indoors, passenger flow – which met problems with bottlenecks on Epic – has been improved. Even those navigating the vast spaces of the Deck 7 casino to get from one end of the ship to the other will find it easier. As for accommodation, gone are the annoying split bathrooms of Epic, and the hand basins that could be operated by foot without leaving your bed. Apart from the single studio apartments, cabins have “proper” en suites bathrooms; mini suites like the accommodation I have are even better, with his and hers taps, a double hand basin, and a roomy walk-in shower with a rainforest head and six powerful body jets. No need to worry about hanging a “Do Not Disturb” sign on the door handle – there’s a red/green light system. At least I think that’s what the red light means ! Another handy hint familiar to Norwegian Cruise Line passengers – if you ever get lost, follow the fish in the corridor carpets to get to the sharp end. 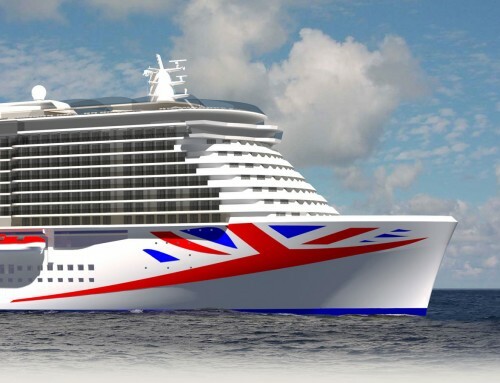 More than 2,000 British travel agents yesterday got the chance to sample what Breakaway offers, their only disappointment likely to be the fact that Norwegian has no plans to resume sailings from UK ports. 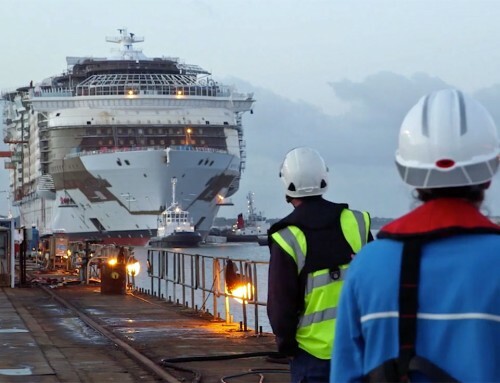 This evening the ship set out on her maiden voyage across the Atlantic taking fewer than two-thirds of her 4,000 capacity, giving the hotel staff chance to get up to speed. By the time Breakaway is sailing on regular cruises, there won’t be a spare bed to be found anywhere, and they’ll be queuing for Getaway, the next ship in line.